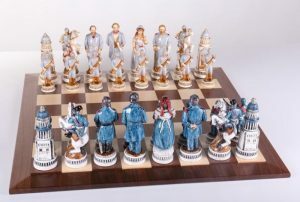 One of the most exciting and interesting ways to collect military memorabilia is through military chess sets. Not only can you enjoy the accuracy of figures from a quality manufacturer, you can also enjoy the competition of this age old game taking on a new meaning. As an example, this chess set represents the Battle of Gettysburg, is beautifully crafted and comes with an elegant storage case. Whatever your interests, you can probably find a military chess set that appeals.